Wood Waste Control's type FD extraction unit is specifically designed to extract fine dust or fumes. Can be deployed at the source of the contamination or as a central system serving more than one machine. 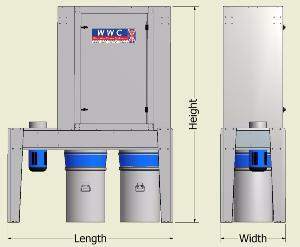 Two motor options are available 3kW or 4kW 3 phase depending on the extraction needed. The FD 2 can be tailored to suit individual requirements, such has an internal or external roof, collection bins or collection bags, silencing kit and optional A.T.E.X explosion relief panel.